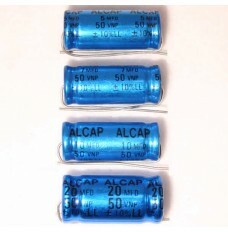 Alcap 50V & 100V Low Loss Capacitors. 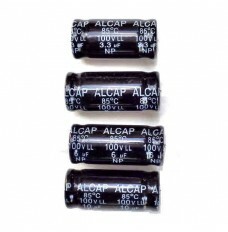 Genuine Low Loss capacitors, low ESR, high ripple current. Exclusive to Falcon, specified by KEF and many other manufacturers. Used in more critical applications than the Standard 50V, e.g. as series feed to a tweeter where high efficiency is desired. Maximum DF is lower than other types at 5% @ 1 KHz. Available in 50V & 100V DC working (depending on value). 50V Low Loss are being phased out and replaced with 100V Low Loss. A loudspeaker which has been voiced using Alcap Low Loss capacitors or where Alcap Low Loss capacitors are replacing original black ELCAP Low Loss capacitors (marked LL) will remain true to the designer's intended sound character. Some 50V Low Loss values are now finished or in short supply. We can no longer supply 24uF or 25uF, please substitute with 100V HP types for these values.